Like Jazz and baseball, pepperoni is purely an American invention. And, like those two very American ideas, it permeates our culture. In fact, pepperoni remains the most popular topping for pizzas in America, being served on more than 35% of all pizza orders. Most people, and rightly so, would have thought pepperoni was born in Italy. Although it is hard to say exactly when it was created, it probably popped up in the early 1900s when Italian butcher shops and pizzerias began to flourish on the streets of a burgeoning Italian-American society. 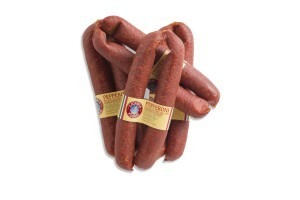 While we may not know its exact origins, we know it when we see it: This air-dried somewhat spicy sausage has a few very distinctive characteristics: fine-grained, lightly smoky, bright red and relatively soft. Traditionally, made by mashing pork and beef, pepperoni is a cured meat product often seasoned with peppers, garlic, fennel, or mustard seeds and stuffed into a casing. And, it has a taste that can only be described, well, by eating it. It adds a slightly spicy and meaty flavor to pizza that is purely its own. “Peperoni” is actually the Italian word for large peppers, as in bell peppers, and there is no Italian salami called by that name, though some salamis from Calabria and Apulia are similarly spicy and flushed red with dried chilies. It might look a bit like its equally tasty cousin, the salami, but it is safe to say that pepperoni has conquered the pizza world and there seems to be no stopping its popularity.